One of the best Hebe varieties for hedging, Hebe Buxifolia is fast growing, easy to prune and has masses of white flowers in spring. Commonly called the ‘Box Leaf Hebe’ for the form of its foliage, it has a naturally dense growth habit and small foliage, both great attributes for a hedging plant. Planting distance when used as a hedging plant should be at around 70 – 90 cm apart. You can also grow Hebe Buxifolia in containers if desired. 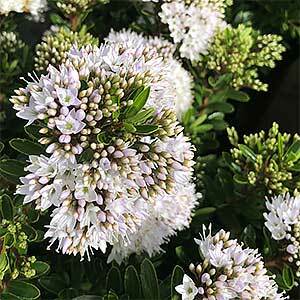 Best grown in full sun to a little afternoon shade, Hebe Buxifolia will grow well in a range of soil types although not waterlogged of soggy soils. Dig the soil over well to twice the width of the container. Add some well rotted cow manure and compost. Fertilise each spring with a general purpose slow release type fertiliser. The best time to prune is immediately after a flowers die back. Foliage – Small rounded and mid to deep green. Frost tolerant – Yes, light to medium frosts. Hebe buxifolia is available for sale from the following participating nurseries.